During winter, everything is gray damp and can be bleak. One way I love to brighten up my winter is with new nail trends. Here are a few of my favorites. Gray Nails—Gray nails compliment every skin tone and are neutral so they go with every look. Some of my favorite gray polishes are Forever 21’s overcast skies polish, which is a light matte gray; RGB Steel, which is a darker gray; and Sally Hansen Insta-Dri Grease Lightning. Pop Culture Nail Decals—These are my favorites. You can find so many quality nail decals on Etsy for under ten dollars and they liven up any plain manicure. Some of my favorite include crying Kim Kardasian, Anne Boelynn, Frida Kahlo, Marie Antoinette (both pre—and post-beheading), and Justin Timberlake through the 2000s. Nail Tape—One of the simplest nail art looks to do yourself is nail tape. The tape comes in either matte or shiny and in many different colors. You simply paint your nails, let them dry, then cut and apply the tape in whatever pattern you desire: from stripes to plaid. You can even apply the tape as a colored french tip. Super cold water: Before you start painting your nails, fill a small bowl up with ice cubes and cold water. Once nails are painted, dip your hands into the bowl of freezing water. This will help set the polish. If you are at a nail salon and do not have access to ice cubes, just place your hands under cold water for about a minute. Cold air: Your hairdryer works just as well as a salon’s nail dryer. All you have to do is set your hair dryer to the cool setting and blast your freshly painted nails with cold air. Spray: Nail drying sprays work extremely well. They are not hard to find and can be purchased at your local drug store. But what works just as well is any type of cooking oil spray such as PAM—yes PAM! Just be sure that you wash your hands a few minutes after you spray your hands with it. Thinner the better: Try doing three thin coats of polish rather than two thicker coats. Make sure you wait a few minutes in between coats. This allows the polish to dry evenly and faster. Even though gel manicures are becoming the new norm, many of us girls still prefer the basic manicure with all its flexibility. I like to be able to change my polish color more often than once every two to three weeks. Chips are inevitable. But with a basic non gel manicure, together with these tips, chips are more manageable. We all know a manicure often won’t last a full week with our daily routines. Here are a few of my favorite ways to extend the life of my manicure and keep my polish looking fresh. Keep nails short—by keeping a shorter nail length, you can prevent snags and tears from occurring. Even if you don’t have beautiful hands, a clean polished short nail can make all the difference. Prep the nail—using a product to remove any oils from the nail bed is an essential step before applying polish. Removing all the oils from the nail bed will allow your polish to best adhere and helps ensure your polish doesn’t chip. Apply a base coat—sometimes we think we can skip this step, but if you want to keep your nails from discoloring while also keeping the polish in place, a base coat is key. The product I favor is Sticky from CND. Apply a top coat—a good and fast drying topcoat should always be the final step. This effort will create a sleek and shiny seal for your polish and keep your manicure from chipping. My go to product is Sech Vite. Always remember that it is important to keep your hands and cuticles hydrated throughout the week. Solar Oil is my favorite all around great oil. Most people have gone to a nail salon or spa for a manicure. Some places are better than others. I have a favorite place that I like to go, but what happens when you’re out of state, or your favorite place is closed? How do you know that you’re going to get the same level of service that you get at your usual place? Do you going to Yelp and read reviews? Do you rely on a friend who seems to know what they are talking about? Do you take the time to go online and research the health code scores over the last several years? With all that, even the top places can still give you bad service. So here are a few tips and things that I want from a nail salon. When you first walk into the salon, has anyone greeted you? Look around to see if you can locate a recent health code score—they’re required to be publicly posted. Always make sure that the person doing your nails has a cosmetology or manicuring license. You always want to be sure that any beauty professional performing service for you is properly licensed. Now look to make sure that the place of business is clean in general. Before sitting down for your service, your manicurist should have taken a clean cloth or paper towel and, with a bottle of disinfectant, sprayed and wiped down the nail station. A clean towel should also be put over the nail station as you’re being seated. It is very important that your manicurist has gotten all the clean, unused supplies from proper packaging. This includes the buffer. Most places try to get away with using the same buffer from client to client, but infection can get spread that way. Relax while the manicurist is performing your nail service, but still pay attention to what he or she is doing. Never let the manicurist cut your cuticles—they should just be slightly pushed back. You’re almost finished. You’ve got nice, pretty, polished nails and hopefully you’ve received a safe manicure with great service. Have fun and happy nails! Nails have become an obsession and a statement over the past few years. There are constantly different nail styles, colours, techniques and decals coming out to keep opening our eyes to new options. Although the classic styles such as French manicure, nudes, light pinks, and a basic clear manicure are still in style, polka dots, floral, caviar, and even velvet nails are coming into the picture. 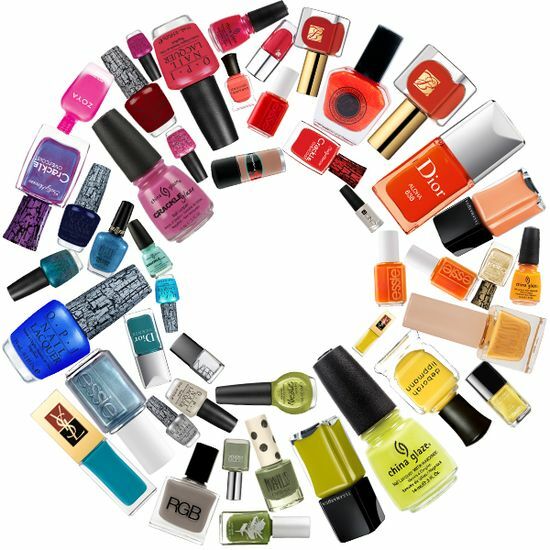 Some of the brands that are up and coming include China Glaze, Rimmel and even some local drug-store finds such as Revlon. We have seen a huge growth in the nail industry over the last few years and people are always drooling to see what’s next! Every trend tops the last and is brighter and more outrageous. If you love nails, keep yourself updated. If you’re just getting into nails, I hope these websites can help you to become more passionate and interested. If you haven’t really tried any of the new trends, you should use these tools provided to explore!! !